We've been on the go, but the garden keeps on. The weekly summer storms and my bug-patrol birds & mantis have kept the garden happy and lush. The local squirrels have shown little interest in my garden as of late. Hoping that as the peppers, cucumbers, and tomatoes ripen the trend continues! This weekend I'll be giving the garden a dose of fish emulsion, all this rain drains the nutrients from the containers plants. I'm hopeful that my little garden helpers will be keen on being in the garden a bit this weekend. Mama needs to dig in the soil! Milkweed. I'm guilting of pulling it. I used to see it as a weed. But, its the nesting spot for monarch butterflies, and I'm happy to give it space in my garden! In the next few weeks the pink flowers will bloom and Im hoping we'll see some monarchs. In addition to providing a nursery for monarch eggs & larvae, milkweed brings an element of height in the yard that was needed. Finding the balance between garden function, beauty, and maintenance level is always tricky. But remembering that the garden is nature & is a part of a greater cycle is easy. Know you climate, soil type, and pollinators and you'll be more successful and find it easier to maintain. This Friday flower is Zinnia. This summer beauty can take the heat of full sun and all it needs is water and occasional feeding - we like Neptune's Harvest. The large blooms will pop out from all angles and draw the pollinators into my deck garden. They get a little zinnia nectar and make stops at the tomato & peppers! This year I'm growing lavender, green, red & pink zinnias (I forgot about orange!) So far the lavender and red are gigantic and gorgeous. I'm hoping that the ones I planted in the ground out-front will do as well as the deck flowers. So far we've seen bees, butterflies, hummingbirds, and finches dine on the zinnias. The finches can be a bit tough on the zinnias, but as long as they don't devour all the blooms I'll allow them to snack. The zinnias in my garden will be going strong come September - which is more than I can say about the pansies and violas in my window-box, they need to be laid to rest in the compost bins! Perhaps I'll find some zinnia plants at the farmers market this weekend to replace the spring blooms that are fading. Do you have a fav flower in the garden? One of favorite herbs is sage. Turns out, it has one of the most beautiful flowers! The sweet purple flowers are bursting with nectar, if only the bloom schedule was timed with our hummingbird visits! A few small pollinators have taken advantage of the delectable blooms, and I have too! I just cut two branches and strung them over the dinning table to dry. These leaves & flowers will come in handy around November. Are any of your favorite flowers from herbs? Now that the weather has warmed my front garden has exploded with perennials and my flowers are brightening things up. I have a mix of store-bought & homegrown flowers this year - one of these days I'll be all homegrown - and most love the sun and heat. Mt thyme & chives came roaring back to life early in May, both need a trim. Additionally I have African Marigolds throughout the garden bringing a pop of color and extremely low maintenance. Also in the mix is a variety of Milk Weed. There's nothing meticulous or well trimmed about my garden. It is for the pollinators and our enjoyment. So few gardens are pesticide-free these days. I try to cultivate a garden full of color, nectar and fragrance for us and those winged friends. Those needing TLC, stay close to the house where they get a reprieve from the intense summer sun. My black violas & pansies will last a few weeks longer because of the afternoon shade. Next to burst open are these bachelors buttons. Many will grow 2-3 feet tall! A it of height mixed in with the low growers makes for an eyeful. You won't find bachelors buttons at the garden center, but you will find the seeds. Plant some now for some beautiful late summer blooms. My garlic beds have moved a few times over the years, this past season I grew garlic in containers on my front patio. Sadly, out of 20 bulbs only 5 produced plants, which means I'm getting 5 scapes! A garlic scape is a flower that grows out of the head of garlic. We cut (and devour) our scapes so the plant focuses the last 3-4 weeks of growing on the bulbs under the ground. A few years ago I detailed the best way to harvest the garlic scapes and then how to harvest and cure the garlic bulbs. Though we only have 5 this year, I'm sure that Gorman Farm and LoveDove Farm will have plenty of garlic scapes & garlic for us to buy, I've got to remember to save 20 cloves to plant this October - location TBD! As the scapes are harvested we'll sauté and grill them up in numerous meals. Over the weekend we enjoyed garlic scapes with our grilled pork chops. How do you cook your garlic scapes? There's a lot growing in my backyard. Hostas, Lavender, Zebra Grass, Black-eyed Susans, and Dahlias. But there's more. Seeds from my upstairs deck garden scattered all around my backyard and now I reap the rewards. Dill, cilantro, mustard greens & flowers are scattered in-between the larger plants. I'm harvesting now before the beds are shaded & Black-eyed Susans fill in the garden beds. When harvesting, weeding, and planting in the garden, take care. Look at your surroundings and keep an eye out for plants that may be poisonous and/or make you itch! Smell and look closely at anything you think is safe. Often weeds will grow in-between other plants, and you may not want to consume those! First stop for the dill, cilantro & mustard greens is the sink! All were washed individually in cold water & spun in a salad spinner. Don't forget about your garden finds in the fridge! Make a plan and use them up quickly. The dill will pair with chives on some new potatoes tonight. The cilantro will be atop shrimp fajitas tomorrow. The mustard greens are destined for a pickle jar & to a pork sandwich next weekend! Found anything in your garden? Chive blossoms, asparagus, or ramps?! We were one of the hundreds that braved Gorman Farm on Saturday & left with 2 baskets of delicious strawberries. The fields were full of kids & berries and the line to pay was full of little fingers sneaking berries from unsuspecting baskets! It was worth the wait! With our 7 pounds of strawberries & a few growing at home we were thinking strawberry shortcake! First we washed then sorted the berries into categories - shortcake, eat all week & eat this weekend. I love this time of year....soon TLV will have their delicious berries too! To make the shortcake we kept it easy. Premade organic whipped cream + trader joes shortcakes + berries macerated in vanilla sugar for at least an hour. A twist of lemon or a sprinkle of sea salt is nice too. Don't cut your berries too small, just hull them and slice them into 2-3 slices. Otherwise they'll be mush, you want some texture. If you're drowning in raspberries, blackberries & blueberries, toss them in. We love this seasonal treat. Next week it's strawberries & balsamic vinegar with thin sliced pound cake. Layer how you like. We have little ones that are whipped cream fanatics, next time I'll make fresh, so we tend to have equal parts cream & berries. I'm pretty sure this sat in front of my son for no more than 3 minutes....it goes fast! It was definitely worth the trip out to Gorman. Though I left with two sunkissed & exhausted kids, we had so much fun picking, snacking & people watching. Are you growing strawberries? Do you have a farm near by to pick your own? The deck garden is already in bloom! Thanks to a great winter growing station in my basement, I have blooming flowers, large greens, lots of basil, fruiting peppers & strong tomatoes. This winter I invested in some new deck containers, Vegtrugs. We are moving away from plastic containers, and looking for something that can grow without taking up too much space. So far, so good! Unlike other years, I mapped out and meticulously planned what I would grow and where. Notably - my deckrail planters are full of flowers to attract pollinators. Last year we had countless bees, hummingbirds, and butterflies. This year we want more! So far the companion planting and locations are working out well. It 's amazing what you can grow in a container. You just need to remember to water a bit more often and feed the plants monthly. 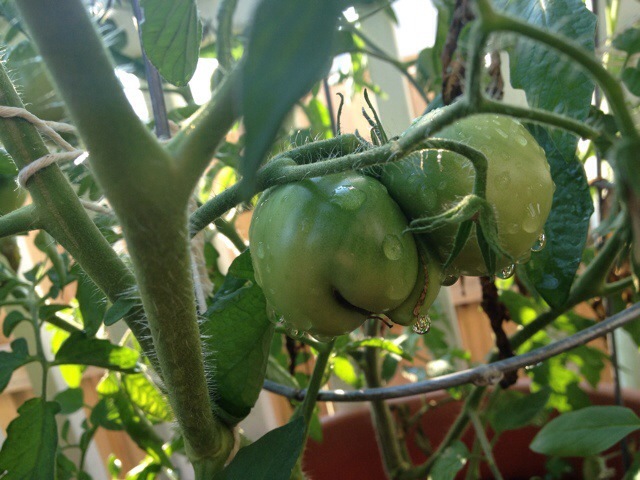 Growing a garden can be a lot of work, but the rewards are tenfold. Not only are you growing delicious food on your own, but you're closer to the ecosystem, and a part of natures beauty. And in turn nature rewards you. One of our fav garden treats is the arugula flower. We harvest them and pop them into salads. Are you growing in containers? What's your fav crop? Hope your garden is a success this year! Back in February, I planted Unwins Mix Dahlia seeds from Baker Creek. Though I saved tubers from last year's dahlia's, I seem to be better with growing from seed - note to self, research dahlia tuber storage! I transplanted two dahlia's into pots right before that frost in April - I brought them inside for fear of the frost! - and another two last week after Easter. The spot is mostly sunny in the morning with an afternoon shady reprieve, which the dahlia's seemed to appreciate last year. This location is also close to our sunroom window, we are hoping the butterflies & hummingbirds stop by for a sip of dahlia nectar! Looks like a yellow bloom is ready burst open! I have a few more dahlia seedlings growing in the basement for the front garden - we're growing for our pollinators, and so should you! After a fabulous weekend in the garden, I came away with a few lessons that I hope I've learned and won't soon forget. This winter was particularly tough on my garden, and I think the culprit was ice. Lesson 1: Rosemary isn't so tuff afterall. Both of my prostrate rosemary plants, rosemary in the front garden & rosemary in the back garden perished in the frigid temps. I hoped that the shelter of the front porch would have spared my prostrate rosemary, sadly no. So now I'm on the hunt for new plants. I prefer the prostrate variety to the taller ones. It seems to flower more and it reminds me of countless trips to Disneyland! Lesson 2: Sage is that tuff! My 5 year old sage plant is coming back strong. Dead gray crispy leaves are giving way to green soft ones. Hopefully soon to follow are those delicious purple flowers! Sadly my pineapple sage didn't make it, but if I see it I'll buy it again. I love the red flowers and the scent. It's worth it as an annual. Lesson 3: Chives are coming back. My garlic & traditional chives are peeking out of the ground & planters. One set was overcome with moss, so off to the compost. But with chives comes my fav edible flower, chive blossoms! Lesson 4: Thyme just can't quit. My thyme plants are springing back to life, so I'd better go trim them! Fingers crossed they'll be as prolific as years past, but just in case I bought a few more. You just can't have enough thyme. Lesson 5: Oregano & Mint, possibly the easiest twosome to keep in pots. Green has been spotted in these pots. I keep both away from the in-ground gardens for fear that they'll take over all garden beds. I use & dry both often. The mint (chocolate) makes a great tea. The dried oregano is a fam fav on all Mediterranean dishes. Learned any lessons in your garden? Get out there & see what's green & what's not! One new green thing in my garden is a vertical garden! It holds 12 small plants. I'm testing out water lovers & haters to see what works best. On this snowy day I'm thinking about garlic. In the fall, I relocated my bulbs from my deck to my front garden, where sunshine is found all winter long. Six cloves per planter could yield 18 heads. Not as much as I'd like, but if they do well then more will be planted autumn 2014. So far I have 3 green shoots, that will - hopefully - turn into scapes this summer. I loaded the containers with compost & fish emulsion in October. They'll likely need another boost of nutrients come March. Hopefully after the latest snow melts, I'll see a few more shoots pop up. Store bought garlic pales in comparison to homegrown...as do most vegetables! Grow your own if you can & you'll be rewarded with garlic scapes & delicious garlic throughout the year! Happy New Year! 2014 is here and we are ushering in the new year with a heaping bowl of black eyed-peas. After the ball dropped in Times Square, I filled my slow cooker with a pound of soaked black eye peas, a ham hock, 4 cups of stock, 6 cups of water, a bay leaf & 2 dried chili peppers. Eight hours (after cooking on the "low" setting) later I had delicious ham & perfectly cooked peas. As my husband picked the ham from the hock, I sautéed 2 shallots, and 2 garlic cloves in olive oil. Then I added in grilled corn, crushed tomatoes & diced roasted poblanos - all from the freezer. Once everything was warmed through, I added the peas & ham. Season to taste & serve with your fav hot sauce. Now it's keeping warm on the stove while waiting for my mother-in-law's corn bread. What a yummy way to celebrate the new year. Yesterday, as we dug out from our mounds of Christmas goodies, my son spotted a bald eagle in a tree on waverly woods golf course. We went on a walk to see if it was plucking fish from the pond on 99 & dorchester but - no sightings. This is a first for us, we spot hawks regularly. Perhaps this is a result of being close to the hoco conservancy. Whether its a migratory passerby or a new western howard county resident, keep your eyes & binocs at the ready! Autumn is here & the garden is slowing down. This year I added lots of flowers to grow in place of many heirloom vegetables that I normally grow. The dahlias were front & center this year, along with French marigolds & zinnias. I did grow 3 varieties of tomatoes, a bunch of hot peppers, Mexican sour gherkins, greens & herbs - but only the tough survived. Here's a photo review of the garden goodies from my garden - I'm hoping the new addition to the family will be ready to get her hands dirty in the garden next spring! Mexican Sour Gherkins: look like tiny watermelons, but taste like pickled cucs right off the vine. The little flowers attracted tons of pollinators as well as teeny parasitic wasps which took care of the tomato horn worms! Next it's time to cleanup the remaining peppers, dry the fruits & plant some garlic. Hope you're enjoying the cooler autumn temps! This year my garden is full of flowers. One of the newbies is the Unwin's Mixed Dahlia. 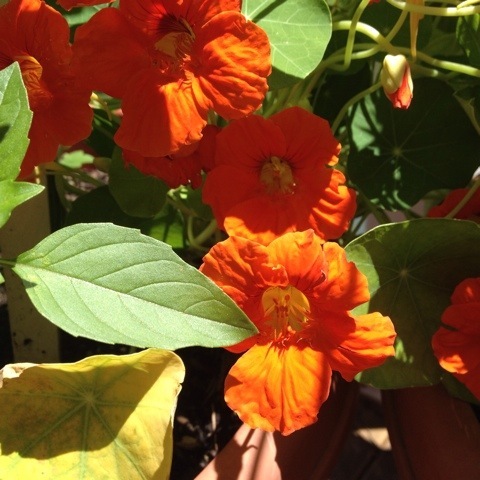 They bloom in a variety of colors and grew from seeds instead of from a tuber. I have so much to learn about these gorgeous Mexican blooms, so I'll be devouring the American Dahlia Society website for tips and more information on the numerous dahlia varieties. Are you growing any new flowers or plants this year? Any surprises? Two weeks ago we welcomed another munchkin into this world! Now that my 5 year old has a mini-partner in crime, I'm taking a few weeks off to acclimate her to the outside world. Hopefully we'll be back to the farmer's markets & cooking with our garden bounty in no time, but if you need a little inspiration hit up Annie's blog for all things locavore. Enjoy the summer & keep an eye out for pollinators & hummingbirds! Zinnias are blooming and Bachelor's Buttons are swaying in the breeze. My flower garden is bursting with color & variety this year. My garden goals were minimal: 1. Attract a wide variety of pollinators & 2. Keep the gardening on the low maintenance side, having a newborn & watching the garden didn't seem feasible. Goal #2 seems to be at hand, but I'm not seeing that many pollinators yet. I'm hoping that they're coming. My veg are running a bit behind schedule, maybe the bees & butterflies know. As I type, I see a bumblebee buzzing in the marigolds. Hope he gets enough nectar before the next round of storms come by. If I remember correctly, the pollinators seem to be out in force once my lavender plants bloom, they seem to be behind schedule too. As long as someone is around to pollinate my veg, I'll complain not! Below is array of the flowers blooming in the garden, some I know, others I don't. If you spot one of my unknowns & know what it is please notify me! I love having an assortment of flowers blooming. It's a little unkempt, but quite beautiful!